BOMB PROOF® Selectorized Seated Shoulder Press Machine - The BP-104 American Made Selectorized Seated Shoulder Press is a popular strength training machine for school weight rooms, training studios and commercial gyms. It includes neutral grips for targeting the front deltoids and wider overhand grips for isolating the side deltoids for building thicker, wider shoulders. The BP-104 seated military press is built from the ground up utilizing commercial grade components starting with the frame which is fabricated using 2 x 2 x 11 gauge steel tubing. The frame combines mig welding and high grade steel bolts for maximum strength, stability and easier installation in facilities with space constraints. The 200 lb. weight stack offers plenty of resistance for even the heavy lifters and is adjustable in 10 lb. increments. Included in the weight stack drive system is 2,000 lb. capacity steel cable with protective nylon coating, reinforced nylon pulley wheels with sealed bearings for long lasting smooth rotation and ultra-smooth steel guide rods. The seat and back pads are constructed from heavy-duty 3/4 plywood backer board and 2 thick high density foam padding and are fully adjustable in 1 increments so that users of all sizes can customize a fit that is perfect for them. Since all Bomb Proof strength machines are made to order, choose your favorite powder coat and vinyl colors per the drop down menu at no extra charge. 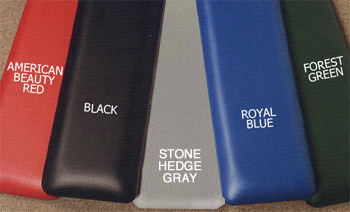 Need custom colors to match existing equipment? Call an Ironcompany strength equipment specialist today for availability.